After the deadly tram crash in Croydon earlier this week, industry experts have stressed that it remains one of the safest forms of public transport and advised against "panicking" by hastily imposing new precautions. Seven people died and more than 50 were injured in the incident in south London, but experts say tram accidents are incredibly rare. Andrew Braddock, from trade body UK Tram, said the accident should be "set in the context of an extremely safe mode of transport". "You are 15 times safer travelling on a tram than you would be in a bus, 24 times safer than you would be in a car," he said. "We had a dreadful incident in Croydon yesterday, there's absolutely no getting away from that, but it's extremely rare." British Transport Police are investigating whether the Croydon tram was exceeding speed limits and the possibility the driver may have fallen asleep or blacked out. 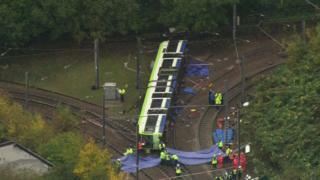 The crash is believed to be the first involving fatalities on board a tram in the UK since 1959, when two women passengers and the driver died when a tram caught fire in Glasgow after a collision with a lorry. Deaths from tram derailments are rare around the world. Several people died and around 50 were injured when a tram overturned in Rio de Janeiro in Brazil in August 2011, while around 30 were killed and 50 injured when a tram derailed in eastern Ukraine in July 1996. Trams were phased out in the UK at the end of 1962 with the closure of the Glasgow network, leaving Blackpool's as the only one running. A new generation of tramways began with the opening of the Manchester Metrolink in 1992, and there are now also networks in Sheffield, Birmingham, London, Nottingham and Edinburgh, and about 300 worldwide. There were no trams in London between 1952 and 2000, when the London Tramlink opened. Mr Braddock described trams as being like a "bus on rails", travelling at similar speeds and peaking in cities at about 50mph. Powered by electricity through overhead wires, drivers control the vehicle using a lever - usually with their left hand - pushing forward to accelerate, backwards to brake and with a neutral stopping point in the middle. But unlike trains, trams are not fitted with systems that apply brakes automatically if they are going too fast or jump a light. The key safety feature is a vigilance device, known in the railway industry as the "dead man's lever" - a device that brakes automatically if the driver is incapacitated. Mr Braddock said: "On the tram control lever there is a button which the driver presses at least every 30 seconds. If that button is not pressed the brakes are applied automatically. "It makes no difference if the driver is powering up or braking, he has to keep pressing that button. It's a routine that you get into." If the driver lets go, the lever springs back to the neutral position, automatically applying the brakes. There is also an emergency stop button, bringing the tram to an immediate stop in the eventuality of an emergency such as a car or pedestrian suddenly appearing in front of it. There were 112 accidents involving trams in the year to the end of March, according to the Office of Rail and Road, including one derailment and two collisions with other trams. Some 102 involved collisions with other road vehicles. Rail expert and author Christian Wolmar was adamant the tram industry had sufficient safety precautions. While the investigation into the causes of the Croydon crash might highlight a safety gap that needed addressing, Mr Wolmar warned against jumping to conclusions from a single accident. He said: "We don't know what the circumstances are but to start saying we need more safety measures is a really bad mistake. "Safety measures have costs and - it is sometimes difficult for people to understand this - you have to have an equation between extra safety measures and the likelihood of it happening and the cost of it. "To start panicking over trams and suddenly say we have to start imposing all sorts of extra measures will make tram schemes even less viable and therefore will reduce the number of people going on what is a very safe system, much safer than cars."